You’re invited to join a free online class from Ligonier Connect studying God’s sovereignty over our suffering, personally moderated by Dr. R.C. Sproul Jr. Whether you’ve recently experienced hardship in your life or would like to be better prepared for when it comes, this course will help you better understand God’s purpose in our pain and suffering. This special class opens today and is free for anyone to join. Each week, you’ll watch a video lecture, read Scripture, and optionally participate in discussion questions with other Christians from around the world. 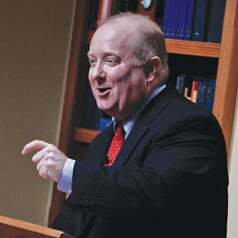 At the conclusion of each week’s lesson, Dr. Sproul Jr. will record an exclusive audio interview in which he will overview what has been learned that week and answer student questions from those in the online class. If you’re attending our 2014 National Conference, you will have the opportunity to attend the concluding session in person. The Ligonier Connect team will be recording this final session for those who cannot attend. Register for Understanding God’s Sovereignty in Suffering, a free online course being personally moderated by Dr. R.C. Sproul Jr.
Ligonier Connect offers over 45 online courses for growing Christians. Thousands of students in over 80 countries take courses in theology, church history, philosophy, apologetics, and more from trusted teachers like Dr. R.C. Sproul and Sinclair Ferguson. Learn more at connect.ligonier.org.